My main subject here however will be the rationale for Radhika’s pointed references to me in what should have been an adult discussion of principle. I found these fascinating, because I have never forgotten a lesson taught me by another friend, an even more attractive young lady with political interests, who said that you only understood people when they were under pressure. That was when the claws came out, and she illustrated this with a wonderful imitation of a cat suddenly extending its paws and hissing. It is therefore quite understandable that Radhika talks about my ‘venomous mind’ and suggests that I am trying to turn her and Rama Mani into ‘targets of hate and venom’ while creating ‘a narrative for Sinhala nationalist consumption’. ‘Ban Ki Moon himself requested that I serve on the advisory panel of the Centre for the Responsibiity to Protect along with Francis Deng and a whole score of UN officials’. ‘Ban ki Moon’s request was oral and made at a senior adviser’s meeting but just to make sure I went through the normal ethics procedure. I will ask the Ethics office whether they will release the documents you requested’. ‘Thanks – perhaps you could try again, pointing out that you had made a request from me, and I had asked for the documentation, and it was specifically to send me the documentation that you had sent them my response to the NYT. Inquire whether there is anything in that which justifies the epithets they employ. Better still, let me also share the query you sent them, in which you sent both articles together. There is general consensus that you are the most irrational, illogical person around so keep your epithets to yourself. Like you I have received death threats from the Tigers so i do not need to justify myself to you or anyone else. I have paid my dues and I do not need to answer to you- who are you? Do what you want and I will prepare myself and all those around me for your vicious personal onslaughts. RC’. Now, instructive as all this is, for someone who still sees himself as primarily a student of literature and, through the written word, of humanity at large, there also seem to me to be political issues involved, relating to our hard won sovereignty and the peace and prosperity we must provide for all our people. For, coincidentally, Radhika’s diatribe appeared the day after a Country Report commissioned by the United Nations High Commissioner for Refugees, which regurgitated much material denigratory of Sri Lanka. The authors of this Report, which is attributed to a British agency called ‘Country of Origin Research and Information’, bases itself almost entirely on material from the West. Of a total of 834 references, a cursory count indicated just 101 from Sri Lankan sources, 85 of them pertaining to statistics. Of the 16 that expressed views, nearly a third were from CPA or ICES publications. The bulk of commentary came from United States Department of State sources, while the Times dominated citations from newspapers. There was I think just one extract from an Indian newspaper, though it should be granted that there was some attention paid to Jason Burke of the Guardian, who has recently provided a more balanced view of the situation in Sri Lanka, albeit with the occasional waspish comment that his British readership have grown accustomed to. I will not comment here on the bulk of the report. It should suffice to say that the tone of the salient features is set by a very early quotation from the Times, in an article entitled ‘Rise of Sri Lankan President’s son sparks concern’, which claimes that 8 of the President’s relatives hold ‘top positions within his government’. These include his ‘older brother’ Basil as the Times or perhaps the UNHCR commissioned report has it, ‘MP’ Shashindra, two ‘first cousins’ and another cousin who is a ‘councillor of Southern Province’. I suppose I shall be next, since the ‘Sunday Leader’ made some such allegation on the same day, a claim that is as erroneous as its earlier assertion that the Governor of the Central Bank was a close relative of the President. I believe Sri Lanka, as a member state of the UN, should ensure an inquiry into the manner in which such ‘Country Reports’ are commissioned and published. I hasten to add that the Head of UNHCR in Colombo evidently knew nothing of the Report, and promised to look into it. As I have said before, I believe that the senior members of the UN in Colombo, at least the current ones, have been doing their best to work positively with the democratically elected government. But this is precisely what the Times told me junior members of the UN claim, in asserting that they have a moral obligation to leak material critical of Sri Lanka. This in effect subverts the cooperation of their seniors – and my complaint is that the leadership of the UN do not do enough to hold these idealistic or self-serving trumpeters of their own humanitarian impulses in check, or accountable for their destructive pronouncements. I suppose Radhika is too senior for Ban ki Moon to check on her. However, as I have said before, we must thank and admire him for the manner in which it was ensured, without any fanfare, that she resign from the Board of the Global Centre Board, despite her earlier claim that she was serving on it at his request. 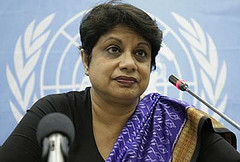 I am also confident, given the care exercised by our representatives at the UN last year, when there were loose statements with regard to the issue of Children in Armed Conflict, that we will not be subject to the insidious pressures of those who tried repeatedly to insinuate that Government and its supporters were as bad as the LTTE in this regard. However, this latest effusion by Radhika, along with other indications yesterday, confirms that we must continue careful lest we go back to the days when we relied on the goodwill of people like her, and found ourselves pressurized relentlessly.